Le Petite Cottage is a quaint studio getaway. It is as nice as any hotel suite in Venice or Santa Monica for half the cost and not to mention more privacy. Just 1/2 block to the beach, this charming French country suite has a cal king bed. The suite is decorated with delightful shabby chic furnishings. 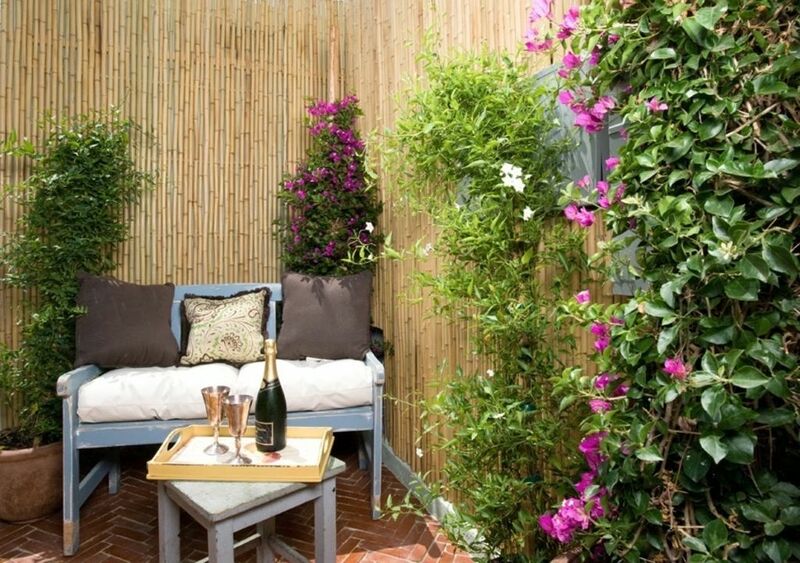 At the private entrance there is a small lovely, tranquil garden patio with a iron bench. and medium sized refrigerator. The suite comes complete with flat screen HDTV, a BlueRay DVD player, cable, WiFi, heating & air conditioning. The Le Petite sleeps 2 very comfortably. There is one garage parking space that comes with the unit. english, Can understand some French and Italian. The bathroom is equipped with a restored antique clawfoot tub as well as a bath mat inside to prevent slipping. Garage parking cannot accommodate large SUVs or large trucks. Nor can it accommodate tall vehicles. We left as soon as we could. It's a roll of the dice whether this'll be a good stay for you or not. We've stayed at plenty of VRBO and other home-stay places. Most are awesome but our experience here was so awful (for reasons that'll become obvious below) that we cut our stay short. The room you'll be in is basically what would probably be a modestly sized (not big as the photos imply) back room of a property (there's even a locked internal door which probably goes through to the rest of it) that in our case had other people in the rest of that side of the house *and* other people on the other side of what was our bedroom wall. Not a problem itself except the walls are thin enough to hear pretty much everything that's going on elsewhere in the property. Everything. All the time and at every hour of the day. In our case this meant being an unwilling audience to the partying couple in the part of the building behind our headboard as they went hard and loud at drinking, talking, singing, stomping around, clinking bottles, crashing doors, making out, dropping stuff on the floors and a whole raft of other stuff. Until around 3:30am. We'd got back from an event Downtown around midnight and the party was in full swing and didn't let up (apart from a brief moment when one or both went out for what we guess were more supplies). By 3am, we got onto the web and found somewhere (anywhere) else to check into and got the heck out first thing that morning. BTW, none of what the partiers were up to is wrong as such; we just don't want to pay to be kept awake by it. I messaged Byrnadette at 3am to let her know we'd be leaving asap. She messaged back late morning - by which time we'd long since left - and said "wish I had known earlier and contacted the neighbours"... well, she was contacted at 3am (and didn't respond until 8 hours later so presumably didn't exactly jump to action then) so I'm not sure what else "earlier" could've been. During that same exchange, she said “Sorry to hear this R u sure u don’t want to come back... current neighbors r checking out today at 11... And the property Should be super quiet tonight” which to us means those noisy guests were hers too. Not cool. So far the owner/manager - Byrnadette – has refused to refund anything despite the issue being within her remit. The dispute is currently with VRBO. You might be luckier than we were - people have written positive reviews for this place – but it really is a case of the luck and where your expectations are at. And whether you can sleep through noise. Great location to the beach and for walking all over. Apartment was clean and well appointed. We loved it! Great place! Super cute and very comfortable! Stayed here with my 7 yr old for a few days. So close to the beach! Very clean! Would totally stay again! Perfect location, good guest service. The apartment is perfectly located just a block from Venice beach, so you are close to all of the action you would expect. The little courtyard out front was a nice touch, and the interior had most everything you could need for a few days stay. The only thing that was not as expected were the bikes that were included with the unit; they were pretty old and rusty. But, service is key: when I had questions both Bernadette and Gary got back to me within minutes. Except for getting in and the AC not working it was good. The place we stayed for very nice and clean. The AC didn't work when we got there and we called to tell them but it was not fixed by the end of our stay. While inside we felt safe but the street where we entered was like an ally way and was filled with trash and some homeless people. I know this can't be controlled by the owner but I would want people to know this ahead of time in case they were staying alone. As I said once we were inside we felt safe and it was nice and quiet. The place was very clean and felt very comfortable except for the AC. Location to the beach was great. Le Petite is a small studio in a great location. Enjoyed the small outdoor space. Adds to the living space and a place to enjoy early morning coffee. Bed was comfortable, wonderful to have a parking space in the garage, quite area (but back of building had lots of garbage cans with trash littered around). A few improvements inside would be a benefit: smaller bed (large king too big for a small studio), claw bathtub though vintage needs an uplift, plastic shower curtains around the tub (mold), tub is not level (rocks) doesn't feel safe, bring your own body soap- none supplied, a luggage stand for suitcases would be great (get them up off the floor), and a deep thorough cleaning would be nice. The flag on my map is incorrect. It is on the street behind, 20th place. About 5 houses away from the beach.